While collaborating with shared Word documents in Office 2011 for Mac, the status bar at the bottom of the window indicates how many people are collaborating and whether any collaborators has saved updates (changes or edits) to the server. When a new coauthor joins the Word 2011 for Mac collaboration, his or her name flashes briefly at the author’s button, and the number of authors changes in the author’s button. When a coauthor starts editing, an indicator displays to the left of the paragraph that is currently being edited. Word puts dotted lines to the left of a paragraph you are editing. When one of your coauthors makes a change, Word displays the name of the coauthor in the left margin and puts a bracket along the left side of the paragraph that was changed. Click the coauthor’s name to display the Presence Indicator for that author. When you see a coauthor’s name and a bracket, you know that updates are available. Another way Word indicates that updates are available is by displaying a double-arrow indicator to the left of a paragraph. Holding the mouse over the indicator displays a ScreenTip. Select the paragraph or paragraphs for which you want to disallow editing by other authors. Choose on the Ribbon’s Review tab, go to the Protection group, and click Block Authors. 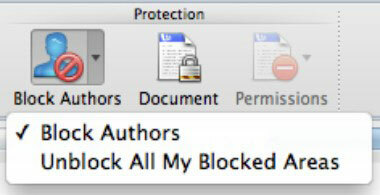 a.To block authors, choose Block Authors from the pop-up menu. b.To unblock areas that you previously protected, choose Unblock All My Blocked Areas from the pop-up menu.